This book has done for mushrooms what The Buzz about Bees did for those creatures – transformed them from the everyday to the amazing. I really hadn’t thought much about mushrooms apart from knowing that they were fungi, but the variation and complexity of these remarkable fruiting bodies – and the more complex organisms that can exist unnoticed under the ground is fascinating. Nicholas Money does not limit himself to the biology of mushrooms but takes us on a trip (occasionally literally) through the human experience of them – locating them in the wild, eating them, producing myths about them (not surprising with the magical way they can spring up overnight) and, of course getting poisoned or high as a result of consuming them. Don’t get this book expecting a guide on how to recognize edible mushrooms – it is a science book, not a guide for wild mushroom hunters – but do expect to be fascinated and beguiled. I have a couple of issues with the writing. When I write a book, my editor is fierce about cutting out my attempts at humour, probably with some cause. Clearly Money’s editor didn’t stand up to him as well, because the book is peppered with very weak humour. It might work for some, but it didn’t for me. I also, strangely, found the most sciencey part the least readable. I found it very difficult to follow Money’s description of the reproductive habits and biological niceties of mushrooms. Now admittedly I’m a humble physicist who share’s Feynman’s revulsion for all the names you have to learn to have a vague idea of what’s going on in biology (yes, we have all those particles, but not many more names to memorise). But I can usually cope with introductory biology – this time it really didn’t sink in. In the end, though, that was a relatively minor part of what was a wonderful adventure among the fungi. It’s pleasantly short and full of interesting stories. 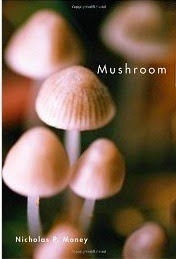 Pull up an mushroom and enjoy.